I have been making the same quiche recipe for the past 20 years. I don’t usually use a base for my quiches as I really cannot see the point in doing so. When ever I am asked to bring a dish with to a tea party I always offer to do something savoury and a quiche is what I make. For my quiche recipe you can use any left over vegetables, or anything that needs using up. I love using spinach but you can use kale or Swiss chard instead. I think that sun dried tomatoes add a great depth of flavour and hand-in-hand with that goes feta. 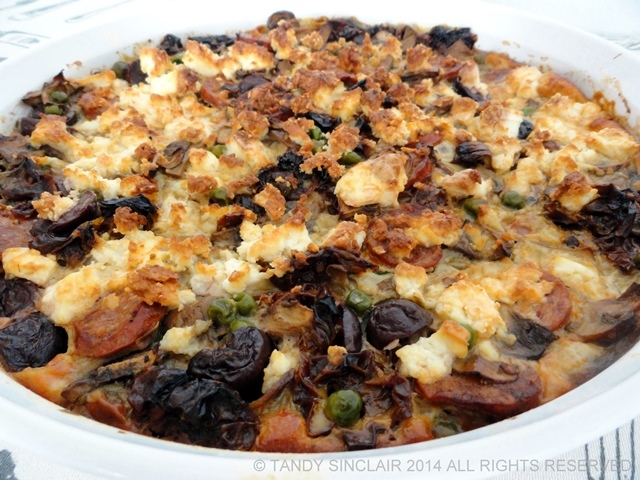 For this quiche I used mushrooms as the base ingredient. Recently, I was taking photographs of each stage of pastry making and I ended up with my pastry shell on the floor! Waste not, want not, is a good phrase to utter in these circumstances (not “oh bugger” as I did), and I rescued the base of the pastry. The dogs managed to help rescue the rest! I used the base to make a quiche – it tasted absolutely wonderful and for going out I will definitely make a base again. But, for just Dave and I, I won’t really bother. This quiche made a great breakfast for us when Dave last went racing. Do you have a dish you always take with when you are asked to bake something? You can use any vegetables that you want for this dish. There’s always something so comforting about a good quiche. With a salad, it’s one of my favourite lunches! This looks amazing! I love the herbs you’ve added and the addition of feta sounds delicious! I love chorizo Tandy, and this quiche looks beautiful and delicious. I was just asked yesterday if I could provide a dish for a Sunday brunch. This just might be it! I hope if you make it that everyone loves it! I also think sun dried tomatoes are the best! That’s a great looking quiche, Tandy. Full of wonderful flavors. I bring my chocolate amaretti cake to parties. Wow the vivid flavours in that quiche are making my mouth water. Chocolate and apricot tart is my most requested baking item to take to places. That sounds like a great tart Sally!